Water Drops Dropping water on a fire is nothing new. I’m sure the cave men knew how to do it, it’s just that fire fighting with a helicopter has elevated and complicated the art. 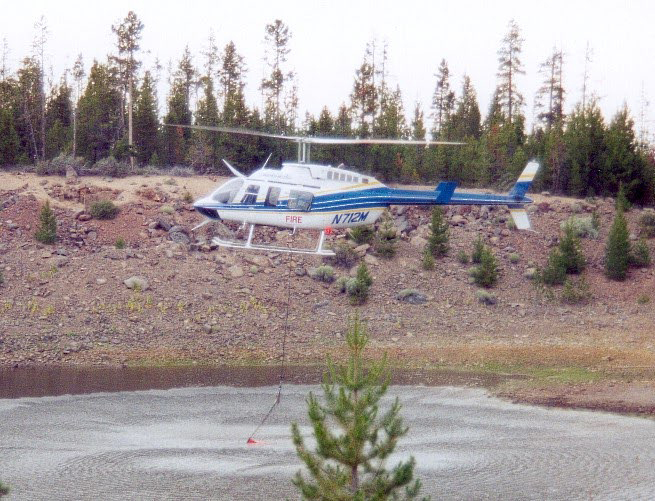 Water gets expensive when picked and dropped by a helicopter. Fighting a large fire is more expensive yet. Many helicopters can pick up more water than my helicopter can, but because I usually arrive in the very early stages of a fire, I can often stop the fire with just two or three loads. You might call my Long Ranger “the little helicopter that could.” I have a Bambie bucket which holds 140 gallons and can be adjusted down to 80 gallons. The bucket was named after Bambie, who worked at a famous firefighters bar in Boise Idaho (more on that another time). Normally I pick up 100 gallons of water, because I’ve determined it to be the safest yet most effective load for the area I work. I based my calculations on the temperature and altitude I fly at, since most of my bucket work is done flying out of ground effect. Dropping water on a wildland fire can sometimes be more complicated than it sounds, so I’ve come up with a few instructions, descriptions, and vignettes on how you should do it, and how I do it. Some things are just “mandatory equipment” for dropping water on a wildland fire. First of all, you need a fire. Lately there has been no shortage of these. You also need a powerful helicopter. Sometimes a semi-powerful helicopter and a good pilot will suffice. Of course you need to have the helicopter and the pilot in close proximity to the actual fire. This is called a fire contract. Being in possession of all these things, makes me a fire contract pilot. Since the Forest Service will waste money on almost anything else, it may seem somewhat ODD that they don’t want pilots hanging around in the winter. Therefore, I am a SUMMER contract pilot, a distinction my wife is alternately thankful for and annoyed by. During Fire Season, the helicopter and crew are dispatched to every fire that occurs on the 11 million acre district we serve. Upon dispatch, I take off with a crew of fire fighters, fire fighting equipment, the bucket and two hours of fuel. When I land and drop off the crew, the bucket is attached and I pick up 100 gallons of water. The crew checks out the bucket carefully before I take off, since my safety and theirs may directly be influenced by my ability to drop water on the fire at the right time and place. To find a dip site near the fire is important. Ideally this dip site would be a pond of about one acre in size, with a depth of about four feet. I have scientifically calculated the optimum depth, based on the concept that if I screw up or the helicopter decides to quit, I won’t have to swim to shore. This ideal pond should be uphill from the fire about a half mile away. You may well wonder, “Why not right next to the fire?” Well, I need time to pick my nose or adjust my crotch before lining up for the drop, and I need time to stabilize the bucket for an accurate drop. I also need to stay out of the smoke a much as possible Uphill is nice so you can glide down to the fire, well not actually glide, but use a lot less power. The ideal dip site would have no trees or fences around it. Have I mentioned that the “ideal” site is completely mythical? It does not exist. The dip sites I use are very different indeed. For instance, the Grand Canyon dip site was a beautiful flight for me, but a tough on the helicopter. The fire was only a few miles away on the plateau but the vertical lift was 1,800 feet out of the Colorado River. I powered off to to descend to the Colorado River, which is wide and a muddy brown color. As I dropped the bucket into the river I pull hover power or about 75% torque, I maintained a little forward airspeed as the bucket made contact with the water. Too much airspeed and you can damage the bucket or worse, pull the helicopter into the river. Too little airspeed and the bucket lays on top of the water like a florescent orange octopus and takes 30 or 60 seconds to sink. The bucket has a weight on on side to help it sink, but the fiberglass bucket can lay on top of the water for a long time. This is especially true if you’re floating down the river, keeping speed with the bucket, and simultaneiously trying to keep your tail rotor out of the bushes. Finally the bucket filled, and slowing, I started pulling power in. At 90% the bucket is almost complexly out of the water and the helicopter started to move forward. Staying in trim with the pedals, I had to use a lot of left pedal now to counter act the torque of the Rolls Royce turbine engine. I edged the helicopter into translational lift as the buckets cleared the water and bushes along the river bank. With the bucket trailing a little behind the center gravity, I increased airspeed to 60 Knots and started my long climb out of the Grand Canyon. I adjusted the torque to just below the yellow line and life is good. I may have the chance to notice the wildlife as I fly in an area that not many people ever see and fewer yet get to fly over at my altitude. Blue Herons flap away from the helicopter and Desert Big Horn Sheep jump from rock to rock when I disturb them on my noisy climb out. At the fire a little water goes along way. Like a shark I try to keep moving with my heavy load, hovering is not out of the question but keeping on the move enhances my lifeline. A spot fire that has jumped the line is easily stopped in its tracks by my water. Often a tree is on fire and a hover drop is the only way to douse it. As my front door was removed when the helitack crew installed the bucket, I can lean out of the helicopter to watch the progress of the bucket before releasing the water. The real trick to accurate dropping is to keep power changes to a minimum on final approach and keep the helicopter in trim to keep the bucket from swaying side to side. Dangers abound when close to the fire, snags sticking up hundreds of feet in the air, burning cinders flying at you over the fire, smoke and bad pilot techniques. Several of the best tricks include the following. A trail drop is handy to help the ground crew establish a line or cool down the fire enough for them to get close to cut a line. I can induce a swing in the bucket to drop behind the snag, I can flare the helicopter get the bucket moving forward and under a big tree where the fire is hiding. I have lots of tricks gained by thousands of bucket drops on hundreds of fires. As the helicopter fuel load goes down and I don’t have additional duties like guiding the ground crews or supervising air tanker drops, I can get in a groove, a beautiful symphony of man and machine. I am often reminded of Viet Nam when shooting rockets, how at a certain point I realized I wasn’t using my rocket sight any more and I couldn’t miss. Sometimes there are not only no GOOD dips sites, but no bad ones either. In this case I may be required to dip out of a “pumpkin.” A pumpkin is a small portable swimming pool installed by the fire fighters near the fire. It is barely bigger than the bucket and about three and a half feet deep. The bad thing about pumpkins is that helicopters pilots can not hide from their fellow helicopter pilots and fire fighters while dipping in the pumpkin. You are there for every one in the world to see how really good you are, even civilians will show up at the pumpkin and watch the action. The good pilots will get the bucket in with little fuss or muss, using the mirror attached to the chin of the helicopter. If you think hovering the helicopter over a pumpkin and placing the bucket in with precision while looking between your legs with the aid of a mirror is hard… well I think you get the idea. Another bad spot to dip in is small canals. Once when a ranch house was threatened by fire I was able to drag my bucket in a cannel for several yards to build up water in front of the bucket. Then lifting up and forward I was able to get half a bucket, which was enough to save the house. Of course the ranch family wasn’t home and are still probably badmouthing the government for their burned fields, not knowing the effort that we went to save their home. Some times you have to dip out of someone’s back yard swimming pool. In Southern California a fast moving fire was threatening several nice homes, one of which had a pool in the back yard. We got permission to dip out of the pool and saved the houses. After the fire was controlled, the owners were lining up to provide cold soft drinks for me and the ground troops.